Olympic speedskater Apolo Ohno and his partner, Karina Smirnoff, survived another results show on ABC’s “Dancing with the Stars” Tuesday and head into the semifinals as one of only five couples remaining. As there was no results show last week due to the election, Week 8 included a double elimination. Actress Kirstie Alley and partner Maksim Chmerkovskiy got the axe, as did actor Gilles Marini and partner Peta Murgatroyd. The other surviving couples are reality show star Melissa Rycroft and partner Tony Dovolani; actress Kelly Monaco and partner Val Chmerkovskiy; retired football player Emmitt Smith and partner Cheryl Burke; and Olympic gymnast Shawn Johnson and partner Derek Hough. On Monday, Ohno and Smirnoff did a tango, complete with a zip-line entrance from the Olympic champ, to Bonnie Tyler’s “Holding Out for a Hero.” Tonioli compared Ohno to Tom Cruise in “Mission: Impossible.” Inaba loved Ohno’s lines. Goodman said Ohno’s frame got a bit wide, but there was a full-on attack to the dance. Scores of 10, 9.5 and 10 gave them 29.5 points. 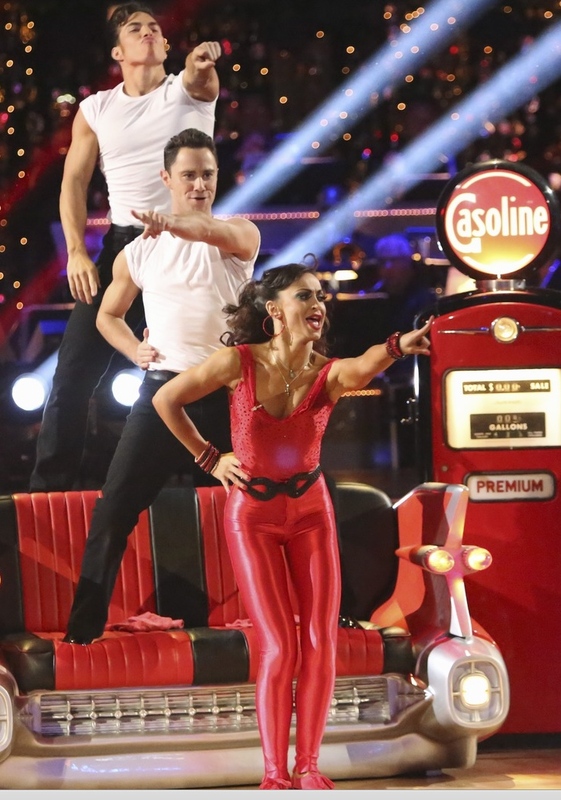 For the trios segment, troupe dancer Sasha Farber joined the couple in their jive to “Greased Lightning” from the musical “Grease.” Tonioli thought Ohno took a huge risk by trying to mirror a pro (the other male celebrities danced with two women), but conquered it brilliantly. Inaba saw a mishap, but still thought Ohno had never shined brighter. Goodman thought the dance was exactly what one wants to see in a jive. Scores of 9.5, 9.5 and 10 gives them a total of 29. In Week 7, for their fusion dance, Ohno and Smirnoff combined the cha cha and paso doble in an action-packed routine to Usher’s “Scream.” Goodman felt that Ohno really attacked the dance when he may have been tempted to play it safe. Tonioli thought it was a clean, powerful, triumphant routine. Inaba loved that Ohno was still pushing himself, as this was the first time he’d ever taken off his shirt on the show. Triple 9s gave them a total of 27 for this fusion dance. They added the 6 they received in the swing dance marathon for a grand total of 33 for the night. In Week 6, the couple admitted they had an off-camera fight that might have affected their routine the week before. They came back strong with a Viennese waltz to Rascal Flatts’ “Skin (Sarabeth).” Goodman said the dance was light with great musicality — two people in perfect harmony. Tonioli said Ohno’s involvement with Smirnoff was the best he’d ever seen. Inaba thought it was mesmerizing poetry in motion. Scores of 10, 10 and 10 gives them a perfect 30 for this dance. DWTS airs Mondays and Tuesdays at 8 p.m. For more information, visit http://beta.abc.go.com/shows/dancing-with-the-stars/.